Visit my favorite sites, see where I learned! Garden database. You can find information on a specific plant. This is an awesome seed germination database. If you have something, and need to know if it need stratification or scarification (or how to stratify something), this is your site. HOW ABOUT SOME WILD AND NATIVE SITES? Want to know anything about Florida native plants? Check out this site, it has many contacts to the presidents of all the chapters. I got lots of information from people I found here. "Your Florida Backyard" has lots of information on Florida's native plants and wildlife. Gives tips on birds, butterflies, books, gardening/native plants, and wildlife.. Talks about weather and disasters, and has a great photo gallery. This is a great site for Florida gardeners. The Backyard Wildlife Habitat Program - National Wildlife Federation My yard is certified as a backyard wildlife habitat, by The National Wildlife Federation. They have a great site. Check it out. Also, look into the Backyard Wildlife Habitat Program for yourself -- it benefits you, the wildlife, the earth, and all your neighbors. Read about it in my site here. Then download it here. I don't normally list 'retail' sites, but I had a request from a nice lady, asking for help in getting her business off to a great start. She sells Butterfly Bushes and many other host and nectar plants. Unfortunatly, she can't ship to Fla, but if you're in one of the states he's licenced to ship plants too, maybe she can help you find great stuff for your butterfly and hummingbird gardens! She told me "My plants are nice, Melany. Honest. The few people who ordered from me last year via the Internet just loved what they got. All called or emailed to say that they just couldn't believe the quality and size they got for the price. I just have to get more people to my site---or give this up and go get a real job!" Maybe you can help her out - let me know how ya like her. PASSION FLOWER SEED COMPANY -The Beautiful World of Passaflora, a webpage in the UK - they sell seeds worldwide. They also have a great page on cultivation and care of your passion vines, as well as a page with thumbnails of their many varieties of passion flowers. And, of course, my friend's pages! Gerald's Butterfly Collection Gerald has some great butterfly photos and lots of tips on butterfly gardening and growing milkweed. Sue's Butterfly Haven Sue has some ideas for butterfly garden plants, and also some great butterfly houses to go see. Randy's Nature Photography Randy has the best butterfly photos out there. 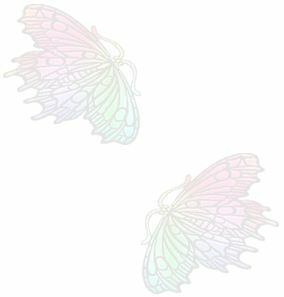 If you're looking to buy a butterfly pic, this is the place. Rachel's Reflections Here is the African Violet expert! If you have questions, Rachel has answers - I speak from experiance. 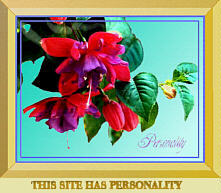 FuchsiaMan's page FuchsiaMan's web site has lots of great pictures of his fuchsias and great music to go with them. Rose Creative Design Works 2 Rick has lots of tips on installing ponds. He has a perennial and shrub of the month, and butterfly & hummingbird flower lists. Post a link to your Web Site in my Free-For-All Links page... Click Here. A special thanks to for the background image. Roxy has lots of great graphics free, 4 a link.